When you think of Seattle, you probably think of Pike Place Market and Starbucks, maybe Amazon and Microsoft if you’re into tech (or billionaires). But you may not know that after getting caffeinated and while avoiding Pike Place, Seattlites are rabid sports fans in a bookish city. I know, I know reading and sports aren’t unusual pass times but Seattle goes full-bore for these two hobbies. The King County Library System is among the top libraries in the country for ebook circulation. The Seattle Public Library System is celebrating the centennial of their summer reading program this year–yes, 1919 was their first summer reading program. Did you know that Twilight, 50 Shades of Grey, and A Discovery of Witches all have Seattle-connections? If those bestsellers don’t catch your eye, how about Terry Brooks, Seanan Maguire, Nisi Shawl, Julia Quinn, Patricia Briggs, and Kristin Hannah? While the 12th man isn’t a Seattle invention, in 1984 the Seahawks retired the jersey number 12 in honor of the fans who are referred to as 12s. Seahawks fans have twice set the Guinness World Record for loudest crowd, both times in the 2013 season. 2018 was the launch of the Major League Rugby league in the U.S. and the winners were the Seattle Seawolves. Seattle was the first U.S. team to win the Stanley Cup as the Metropolitans in 1917. Basically Seattle is a great place for readers and sports fans. And what happens when they get combined? Seattle sports romances. I mean, that’s one thing that can happen. I stumbled into this corner of Romancelandia and was intrigued to find Seattle so well-represented in sports romance. Sadly, I didn’t find a lot of authors of color writing Seattle sports romances. If you’ve got any, send ’em my way! 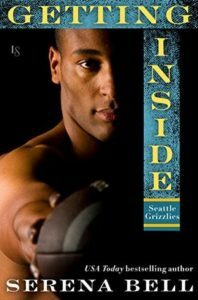 Published in 1998, this sports romance centers around an imaginary Seattle hockey team, named from a Salish-speaking Native American community who traditionally lived along the Columbia River. (. . .) The earlier books in the series may not have aged well (see above choice for Native American-inspired mascot), but the series spans 12 years of publishing. Apparently fake Seattle hockey teams get salmon-related mascots. (Chinook and sockeye are both local kinds of salmon.) This eight book series includes a few novellas all focused around the players of the imaginary Seattle Sockeyes hockey team. The series starts with Skating on Thin Ice, about the establishment of an NHL team in Seattle. If you want to cut straight to hockey playing, go with Crashing the Net. Heck yeah that’s the Space Needle behind him! Davenport is a self-professed life-long sports fan, and proud Puget Sound resident. This first of her Seattle football romance series. In the first book, Fourth and Goal, Seattle Lumberjacks professional player, Derek is struggling on the field until he finds some engaging activities off the field with old flame, Rachel. This one is actually a lone sports romance in a series of Seattle-set romances. He is a professional football player for an unnamed Seattle team, she’s his sister rocker friend and isn’t into jocks. Usually that is. WAGS, or “wives and girlfriends” refers to the partners of professional athletes, by way of the British media. 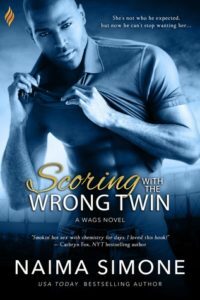 Scoring with the Wrong Twin starts the series with a Puerto Rican computer programmer impersonates her supermodel twin sister as a favor, where she meets the Washington Warriors tight end. (Ahem.) Romancing ensues. Did you know that fish are a big deal in Seattle? Yes, this is the third fake Seattle team with a fish mascot. This is also Davenport’s second Seattle football sports romance. The first book, Snap Decision, has a bad boy, the girl next door, and a remote PNW island. However, Game Changer, where the Steelheads tight end (. . .) gets entangled with a horse breeder finally gives us a sportswoman! Also of note, the cover model for Blindsided, book two, has chest hair! This is a standalone, so far, about the Seattle Grizzlies team getting a new coach, a woman! She’s caught balancing her professionalism with her attraction to one of the linebackers. Shifting towards the new adult arena, this third Davenport football series follows college football players at the imaginary Tyee University. The first book is the second chance romance with Riley and Tiff, who had been an item in high school. Sacked in Seattle might be my favorite title today. First things first, “skookum” comes from Chinook jargon, meaning “strong” or “monstrous.” See, it all comes full circle. Zeke Wolfe, brother to leads from the Steelheads and Sockeyes series, suddenly finds himself with a fake fiancé and three children. Hijinks and romance commence. When I stumbled on the little pocket of Seattle-based sports romance, it was a fun rabbit hole to explore. However, at the end I’m left with a laundry list of wants from future Seattle-set sports romance. If you’ve come across any books that fit these criteria, please share! I didn’t find any Seattle basketball romances. Is the Supersonics wound still too fresh, Seattle? What about the other sports in Seattle? MLS? NWSL? WNBA? MLR? What about sports that aren’t professional in Seattle? More curling romances please. Where are the sports romances about Seattle’s women athletes? Where are the queer Seattle sports romances? I mean, the other Seattle sports power couple right now is the Reign’s Megan Rapinoe and the Storm’s Sue Bird. It’s not like the city would be surprised by a F/F sports romance. Rugby is an all-gender sport and Seattle has several LGBT-friendly teams–sounds like a prime zone for pushing the genre outward both in terms of gender and sexualities. And can we please get some Native-penned Seattle sports romances? 50 Must Read Gay Romance Novels, 100 Must-Read Sports Romances, 5 Figure Skating Romances for Your 2018 Olympics, and 8 Baseball Romances to Check Out.